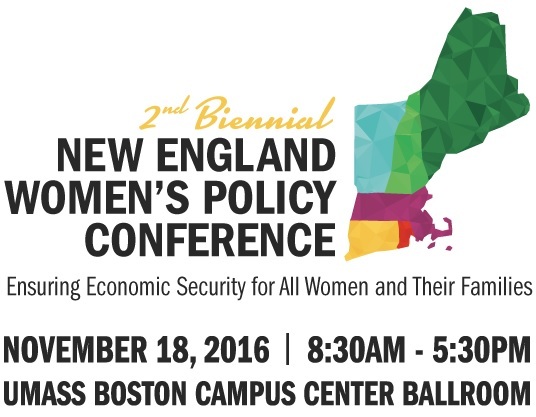 Nearly 400 women from across New England attended this biennial gathering to discuss policy solutions that address inequality and help to close the wealth gap. Participants were treated to a keynote by historian, professor and former Chair of the U.S Commission on Civil Rights, Dr. Mary Frances Berry. Featured speakers included Alison Quirk, the Executive Vice President and Chief Human Resources and Citizenship Officer of State Street Corp., and a suprise personal appearence by Massachusetts Sen. Elizabeth Warren. Recovery for All? A Snapshot of Women’s Economic Status in New England: Released at the Conference, this report compares and contrasts earnings data and explores policy solutions in VT and neighboring states. Women-owned businesses are vital to Vermont’s economy. Women own 23,417 businesses in Vermont, which employ 36,326 people, and generate annual revenues of approximately $2.2 billion. Although growing at a faster rate than businesses owned by men, women-owned firms in Vermont are fewer in number, smaller in size, and lower in annual revenues. Between 2007-2011, the number of female-owned businesses grew 15%; during the same period male-owned businesses grew by only 6%. Women-owned businesses generate 9% of gross revenues and employ 12% of workers in privately-held Vermont firms. Women business owners are significantly underrepresented in 9 of the 10 highest grossing sectors. This limits financial opportunities for individual women and their potential contributions to Vermont’s economy. Women-owned businesses have the potential to play a much bigger role in Vermont’s economic development. If the percent of women-owned businesses that are employers matched that of male-owned businesses, and those firms had the same average receipts, it would add $3.8 billion to Vermont’s economy. If Vermont women chose business ownership at the same rate as men, it would result in more than 10,500 new businesses. If just 1 in 4 of the existing 20,786 women-owned businesses without employees hired just one worker, it would result in an additional 5,200 new jobs. Maximizing the potential of women-owned businesses – and indeed all of VT businesses – requires new and better data. While existing business-related data sources can provide reliable top-line statistics, they are less useful in revealing nuanced information about the motivations, challenges or opportunities experienced by Vermont business owners. Focusing on the finer points of what makes a business successful is critical to Vermont’s economic future. Read more about the Family and Medical Leave Insurance (FaMLI) Coalition here. View a photo slideshow of the Coalition's launch on the Facebook page of the Family Center of Washington County, or read press covereage of the launch here. Vermont Commission on Women, the League of Women Voters of Vermont, and Vermont Federation of Business and Professional Women hosted a Gubernatorial Candidate Forum on Women's Issues Forum moderated by Anne Galloway of VTDigger.org. Candidates attending were: Bill Lee, Liberty Union Party; Sue Minter, Democratic Party; and Phil Scott, Republican Party. 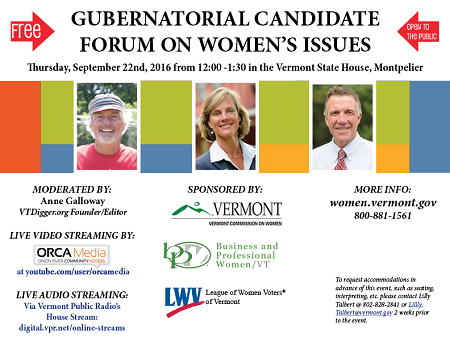 Forum held at the Vermont State House, Montpelier, VT on Thursday, September 22, 2016. Link to forum press coverage here. Watch the full event video here, from Vermont In Person. VIew the slideshow we developed for the event with candidate questions here. Always fabulous and always free, this day of inspiration for women of all ages and stages took place on Saturday, June 4th at Vermont Tech in Randolph. Keynote speaker this year was United States Attorney General Loretta Lynch. Read her remarks here. Sen. Leahy's remarks featured our Change The Story initiative (see video below) - read them here. VCW's Cary Brown co-presented the workshop: Your Legal Rights in the Workplace with Julio Thompson of the Vermont Attorney General's Civil Rights Division, and Karen L. Richards of the Vermont Human Rights Commission, pictured below.